A good starting point is the railway station Haugastøl. 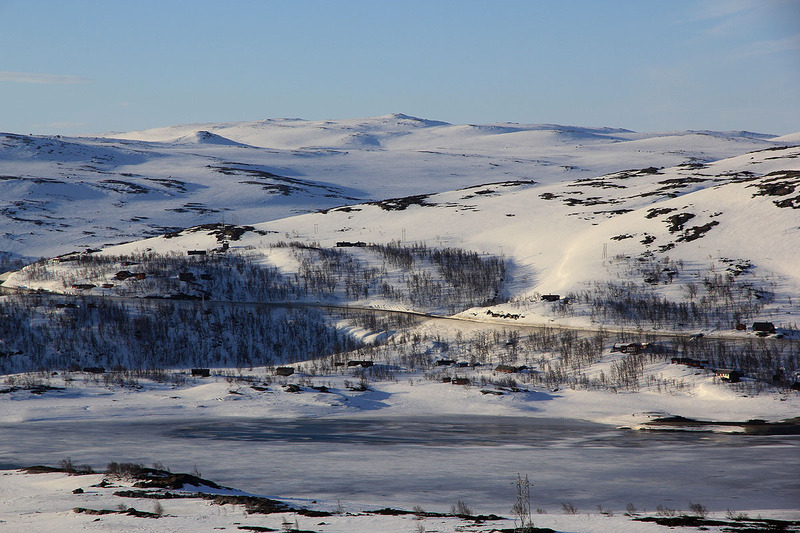 This is the last station before Finse when travelling from the east. It is also the point where the road (Hwy. 7) and the railroad separates when travelling westward. Note that in (late) winter, the lake Ustevatn is lower and there is a land connection from the railroad station to the area south called Tangen. There is a solid wooden bridge across the short, connecting river. This is not well shown on current maps. Ski south from the railroad station and cross the bridge that connects this area with the small penisula Tangen. Continue south to the proper south side of the lake. The route ascends this hillside while tending slightly west of south. Higher up, you will see a pretty distinct summit directly south. As it turns out, this is the false summit marked at 1320 meter on the map. Monsbunuten is located about one kilometer further south. 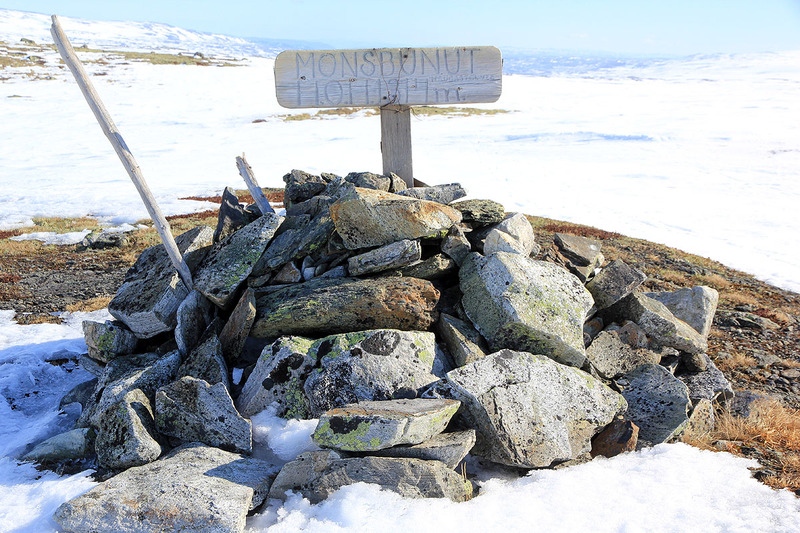 Also note that the cairn on Monsbunuten is located slightly north of the highest point. I was having a very nice weekend with friends (Henning, Per, Trygve and Jeremy) from Bergen. Henning Lygre owns a mountain hut located on the hillside just north of the railroad station. On Saturday, we had been skiing to the Lordehytta, a very nice mountain shelter built in 1880 by the English lord Garvagh jr. I started back after about a 10 minute rest and skied further east to avoid the false summit. Near perfect conditions with a predictable crust having a slightly softer top surface. Back near the railroad station by 1230. We returned later that day by train to Bergen at 1700. Thanks to Henning for organizing a very nice pre-Easter weekend trip! Monsbunuten, as seen from Haugastøl. Actually, this is the false summit. The true summit is hidden further behind. Hallingskarvet, as seen from the first summit (1320 summit). 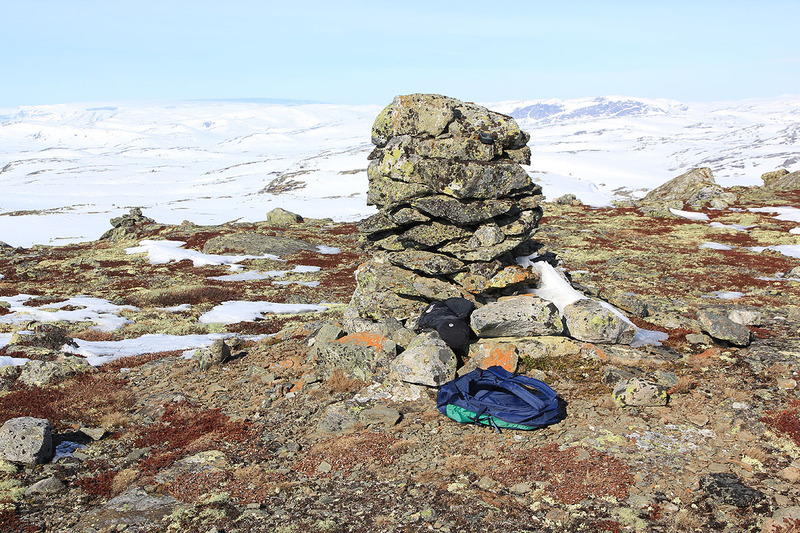 The cairn on the false summit.